Based on the results of Combined Higher Secondary Level Examination (CHSLE), 2015 dated 28.08. 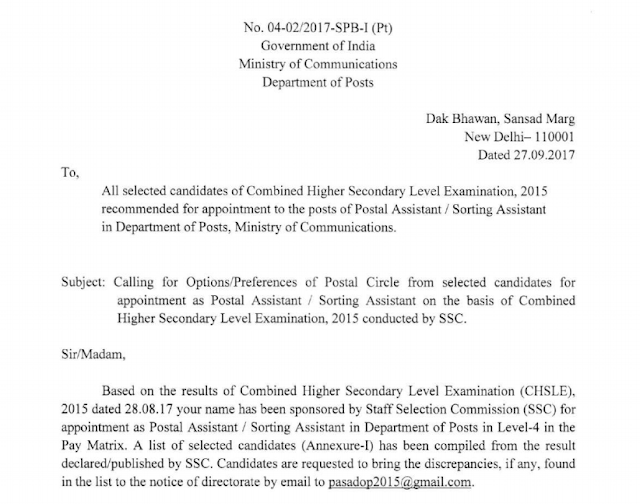 17 your name has been sponsored by Staff Selection Commission (SSC) for appointment as Postal Assistant / Sorting Assistant in Department of Posts in Level-4 in the Pay Matrix. A list of selected candidates (Annexure-I) has been compiled from the result declared/published by SSC. Candidates are requested to bring the discrepancies, if any, found in the list to the notice of directorate by email to oasadop20l5@email.com. You are requested to indicate your preference of Postal Circle in Annexure-IV in the manner outlined in the Annexure-lll indicating name and code of Postal Circles. The duly filled-in Option Form (Annexure-IV) must be sent either by e-mail pasadop20l5@gmail.com or Speed Post / register post to this office by 31" October, 2017, failing which it would be presumed that you have no preferences for Postal Circle.